Problem Description It starts as faintly dark areas on leaves which develop small, white specks. 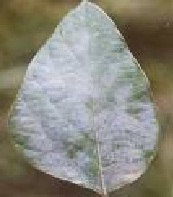 It starts as faintly dark areas on leaves which develop small, white specks. These enlarge and coalesce to form complete coating of the white powdery mass on leaves, stems and pods. In severe epidemic, defoliation takes place, pods are not formed and already formed pods remain small and bear abnormal grains. The disease becomes more severe at flowering stage and persists till harvesting.